Howdy! Senior Writer Jason Heller here. 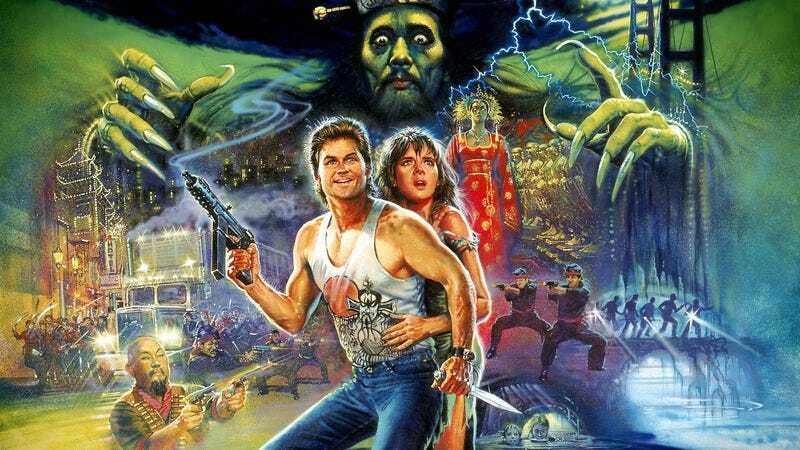 Just wanted to let you know that Fantastique, Alamo Drafthouse Cinema Denver’s monthly fantasy series, continues tonight with Big Trouble In Little China. John Carpenter’s 1986 cult classic explores ancient Chinese magic in San Francisco’s Chinatown. Kurt Russell channels his inner John Wayne in an over-the-top urban fantasy that’s simultaneously a sendup and a celebration of the square-jawed action hero, not to mention Hollywood’s obsession with martial arts and Asian culture in the ’80s. And with the recent news of a possible remake staring Dwayne Johnson, now’s the perfect time to revisit the original on the big screen. Like Science Friction, our sister series focusing on sci-fi films, Fantastique is curated and hosted by yours truly (Hugo Award-winning editor, book critic for NPR.org, Senior Writer for The A.V. Club) and Frank Romero (cofounder of Denver Comic Con). Frank and I will appear in person to introduce Big Trouble in Little China and pick the winners of this month’s giveaway: Three copies of Vermilion, a brilliant new novel from British Fantasy Award-nominated author Molly Tanzer that mixes steampunk and Chinese-American culture in a rollicking tale of an alternate-reality Old West (courtesy of Word Horde). Molly will also be our guest host for the evening, offering her perspective on the enduring magic of Big Trouble In Little China. But that’s not all: The geek-rock bands H2Awesome! and Daenerys And The Targaryens will combine forces to play a set of nerdy pop-punk before the movie. They’ll start rocking at 7:00 p.m., so come down early and get an earful. Big Trouble In Little China, along with all Fantastique and Science Friction screenings, is sponsored by The A.V. Club. Tickets are on sale now.